I have been experimenting recently with contemporary cocktails and some of my own creations. But there are drinks which have stood the test of time, and for good reason. I find myself drinking these tried and true drinks quite often, and one that I constantly return to is the Sazerac, a classic New Orleans cocktail steeped in history and flavor. Add a small splash of Absinthe or Herbsaint to a lowball. Swirl to coat the inside of the glass and discard the remainder (or drink it!). Add rye, simple syrup, and bitters to a mixing glass or shaker with ice. Stir well. Strain into the Absinthe coated lowball glass and add a large ice cube. Squeeze a lemon peel over the glass to expel the oils. Rub the rim of the glass with the lemon peel and toss it into the glass as a garnish. The Sazerac's history can be traced back to New Orleans around 1850. At this time, Aaron Bird took over the Merchants Exchange Coffee House, which was a bar in New Orleans. The previous owner used to import a cognac named Sazerac-de-Forge et Fils, so Bird renamed the bar the Sazerac House. The specialty cocktail of this bar was the Sazerac, made with the Sazerac cognac and bitters made by a local pharmacist named Antoine Amedie Peychaud. Flash forward many years. Now the owner of the bar is Thomas Handy. At some point Handy divulged the recipe and it was published in 1908 in The World's Drinks and How to Mix Them. However, the published version did not call for cognac, but instead for "good whiskey," which at the time in New Orleans, would have been rye. This is why the drink is now made with rye instead of cognac. A few things to keep in mind about the Sazerac. Traditional recipes call for muddling of a sugar cube. For my loyal readers who recall my post on the Old Fashioned, I detest muddling sugar cubes. The sugar rarely fully dissolves and using simple syrup allows you to control sweetness much easier. Also, I like using gomme syrup in the Sazerac. Gomme syrup is just simple syrup with gum arabic, which gives the syrup and the drink a silky mouth feel. Also, a tip when coating the glass with Absinthe: if you are making many drinks then pour a bigger splash into the first glass and then use the excess for the next glass and so on. This reduces the eventual wasted Absinthe if you are going to pour the leftover down the drain. Lastly, the Sazerac is rare in that it calls for a specific brand of bitters. Peychaud's is easily found and I suggest picking it up since it is commonly used in cocktails. Some people like to add one dash of Angostura as well to the Sazerac. I leave that to you. Angostura adds nice cinnamon and spice notes to drinks, but I like my Sazeracs without it. The Sazerac is a classic cocktail for modern times. I like it year round but it is particularly nice in the winter. 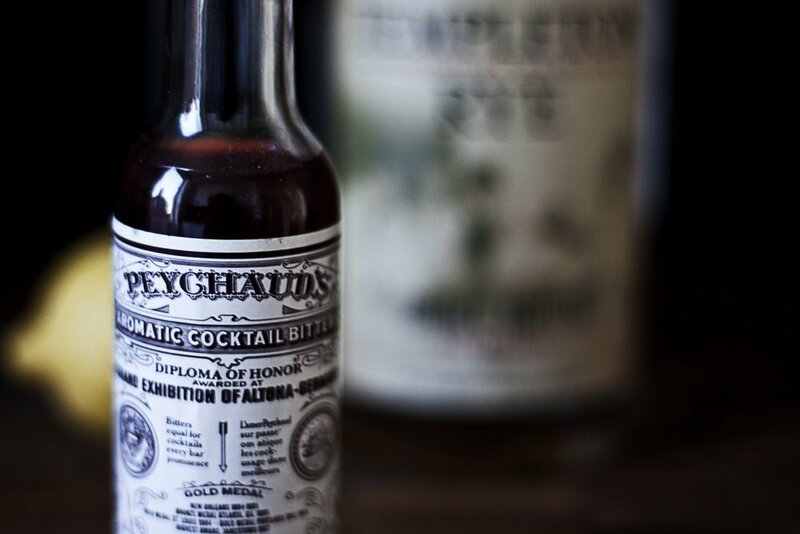 The spiciness of the rye, the subtle sweetness of the sugar, and the anise aroma of the Absinthe and Peychaud's bitters make for a drink which is much more complex than the number of ingredients suggests. Enjoy!